So long, Pete & Toshi. It’s been amazingly great to know you. 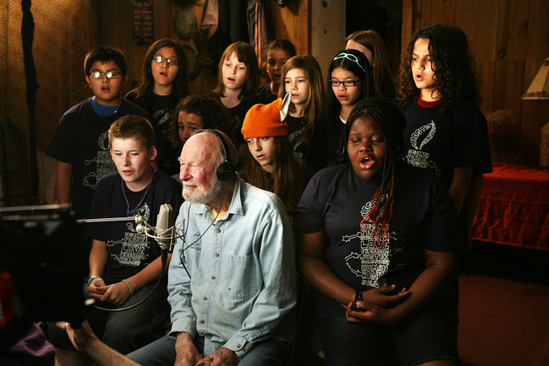 Pete Seeger recording with the Rivertown Kids, June 2011. Image from RivertownKids.org. Toshi and Pete Seeger defy description except through the sheer joy and honor it was to know them, however briefly. Their list of accomplishments will fill many printed pages, which all pale next to the simple core beauty of the lives they led. They showed us it’s possible to live lives that somehow balance political commitment with joy, humor, family, courage, and grace. All of which seemed to come as second nature to them, even as it was wrapped in an astonishing shared talent that will never cease to inspire and entertain. Pete passed on Monday, at 94, joining Toshi, who left us last year, at 91. They’d been married nearly 70 years. Somehow the two of them managed to merge an unending optimism with a grounded, realistic sense of life in all its natural travails and glories. Others who knew them better than I will have more specific to say, and it will be powerful and immense. But, if it’s OK with you, I’d like to thank them for two tangible things, and then for the intangible but ultimately most warming. 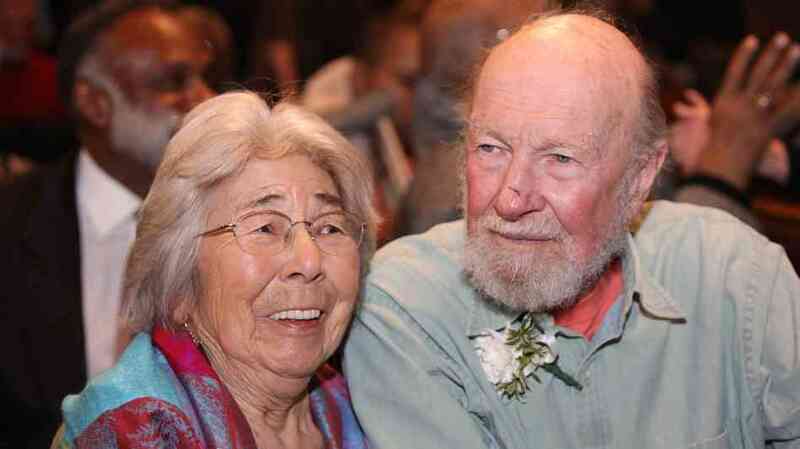 Toshi and Pete Seeger in 2009. Photo Bennett Raglin / Getty Images. Image from NPR. First: In 1978, we of the Clamshell Alliance were fighting the nuclear reactors being built at Seabrook, New Hampshire. An amazing grassroots movement had sprung up. With deep local roots, it helped birth the campaign for a nuke-free/green-powered Earth that still evolves. We had staged successful civil disobedience actions in 1976-77 that grew from Ron Rieck solo climbing a weather tower (in January!) to 18 arrests to 180. Then in April 1977, some 2,000 folks came from all over the U.S. to an occupation whose 1,414 arrests filled the Granite State’s National Guard armories for two media-saturated weeks. In the summer of 1978 a complex, controversial chain of events led us to shift from a civil disobedience action to a legal rally. It was daring, difficult, and divisive. We had no idea what would happen. …the weekend dawned with bright sunshine… and with Pete! But the weekend dawned with bright sunshine… and with Pete! Joined by Jackson Browne and John Hall, their presence helped transform a challenging gathering into something truly transcendent. It was, like Pete himself, an unassuming miracle. Thirty years later our sister Connie Hogarth brought me to Pete and Toshi’s hillside cabin overlooking the Hudson, not far enough from Indian Point. With utter nonchalance Pete had built one of the world’s first electric vehicles by gutting the engine from an old pick-up and filling it with car batteries. It got him to town and back. It did the job. Like the Clearwater. A boat to sail the Hudson. To do it well while making a point about the Earth and what she needs. They chopped wood and made preserves and it was all so comfortably grounded. Toshi had a deeply affecting grace, an irresistible combination of firm direction and gentle wisdom. And those sparkling eyes. What a glorious partnership! But I had an agenda. I wanted a song for Solartopia, a vision of a green-powered Earth. And who was a pischer like me to ask? Pete Seeger with Lynne Cherry and Harvey Wasserman. Photo by Connie Hogarth. Pete’s response was instant, warm, enthusiastic. He whipped out that legendary banjo of his and within five minutes he had a song. A good one. He asked me to write some verses, then gently informed me that as a songwriter, I should keep my day job (which would’ve been great if I had one!). So he handed me a set of envelopes carefully addressed to various lyricists. We kicked the thing around for a year or so. Then his wonderful colleague David Bernz came up with verses Pete liked. Joined by Dar Williams and a chorus of “Rivertown Kids,” they recorded it in a single take, and it found its way on to an album that won a Grammy. …for all the catalogue of his political battles, his unshakable integrity, and his giving nature, this was a guy with an astonishing talent. Something only Pete Seeger could have done. Because for all the catalogue of his political battles, his unshakable integrity, and his giving nature, this was a guy with an astonishing talent. A man who conspired to give the picket lines of the world “We Shall Overcome” and then took “Turn! Turn! Turn!” from the Bible to a rock anthem. A performer who could sing and sing well deep into his nineties, his innate sense of justice and dignity completely in tact. So we could go on and on like that, but Pete and Toshi wouldn’t have had the patience for it. Their longevity was a great gift. It gave us all time to appreciate them, to assess what meant the most to so many of us about them, to understand the beauty of their mentoring. These were people who knew who they were and stayed true to it. They were incredibly talented. They raised their kids, lived on the land, learned as they went along, embraced new things, but stayed true to an abiding faith in compassion and grace. So now… with tears of gratitude and joy… so long, dear friends. How good it’s been for all of us to know you. This article was also published at EcoWatch and was cross-posted to The Rag Blog by the author. This entry was posted in RagBlog and tagged American Musicians, Clamshell Alliance, Deaths, Environmental Activists, Folksingers, Harvey Wasserman, No Nukes, Nuclear Power, Peace Activists, Pete Seeger, Rag Bloggers, Rivertown Kids, Toshi Seeger. Bookmark the permalink. I made me happy to read this personal remembrance and tribute. I have my own memories of Pete, the most important being some time on the Clearwater in 1969 on the Hudson, with Pete as host, and me writing about it for Liberation News Service. 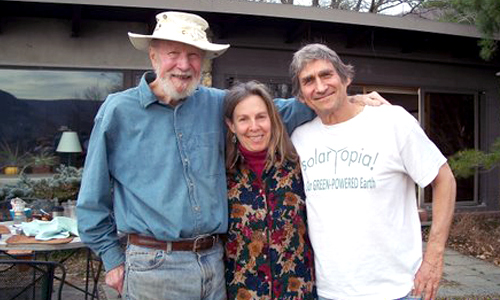 Loved your remembrance of Pete and Toshi Seeger, two so well grounded people, missed and cherished by many. Coming to the US at the end of the Sixties I learned and got to know more about the peace movement, civil rights struggles through music and its many protest songs and got involved like many others in a quest for justice and social change. The music of Pete Seeger is a wonderful legacy which I always will cherish- un gracias and heartfelt thanks. Pete was bigger than life. Where ever there was a cause he was there strumming and singing. There’s no better activist role model than Pete. He’s a inspiration to our generation and generations to come. It just doesn’t get any better than Pete.